Chitwan National Park is the only dominant Habitat for the one horned rhinocerous in Nepal. They have been under conservation from the local support as well as aids from various conservational agencies. But while they are restricted in a small patch that is only in Chitwan in that large no. there might be to much risk of loss of this valuable species if any unusal clamities occurs. So, it is equally important to expand its natural habitat as it's to protect it from poaching and illegal trading its organs (esp. horn of rhino). The translocation help in the conservation of the species for the long term as when they are limited to only a small part then its losses heterogeneity in their gene and a superior offspring can't obtained as they becomes genetically weak. 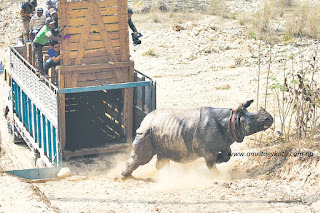 The Rhinoceros translocate to another region that might to the Shuklaphata wild life reserve have generated the behaviors for adapting the changing habitat. This widespread types of habitat makes them familiar with the wide range of habitat and can survive in extremities and changing environment. Nepal has trans-located 87 rhinos to Bardia National Park and 4 rhinos in Shuklaphata Wildlife Reseve (now National Park) in 2003 and the rhinos are well adapting in that environment. Before 2003 there were 5 rhinos translocated in Bardia National Park and only one present in Shuklaphata Wildlife Reserve. Now, the conservationist are focused on how rhino population can be increased and they came in conclusion that Bardia and Shuklaphata are the best location habitat for spreading the Rhino Population and conserve the ecology required for it. So, National Trust for Nature Conservation (NTNC) authoritize decide to translocate 5 Rhinos in to Shuklaphata National Park. Translocation is not the easy task. Translocation does not only holds shifting a wildlife of a habitat to another with the similar characteristic as original habitat to avoid the completion in the original habitat and maintain population of the original place. Before trans-locating a wildlife a deep study has to be done in detail that which cover its all habit, interest, preference and similarity of habitat types should be taken into consideration. Habitat suitability is checked well before we take a bold decision on translocation of that examined species. Habitat suitability index is prepared on the basis of numbering to the site quality. The site quality with ideal condition to the species is numbered higher and regarded higher on the basis various factors are checked such as water, cover, shelter, prey and predator species, etc. After the study the result gives us an outline whether it is good to translocate to that place or not.